MANILA, Philippines - After exiting from a preempted word war with Supreme Court Chief Justice Lourdes Sereno recently, President Rodrigo Duterte is now going head-on-head in an intensifying verbal tussle with Senator Leila De Lima. The issue? Drugs of course. A more ferocious De Lima faced the media last Saturday (August 20), to air her side of truth against the series of allegations hurled to her by no less than the president. The neophyte lawmaker is currently under fire after Duterte publicly accused her as a coddler of drug criminals during her time as Secretary of Justice. Aside from that, De Lima was also branded as a beneficiary of illegal drug payola with the help of her former driver, Ronnie Palisoc Dayan, whom Duterte tagged as her lover at the same time. De Lima vowed innocence against the attacks but admitted that there are "snippets of truth" from the web of “absolute lies” spewed against her. The beleaguered senator mustered enough strength to face the media and deny the allegations. De Lima even proclaimed that she is willing to resign and be shot in front of Duterte should the latter's camp will be able to present "true evidence, not coerced, manufactured, fabricated (or) invented." De Lima vowed innocence against the issues linking her with drug syndicates and said that these issues hounding her right now were manipulated to serve as distractions in the coming Senate probe about the extra judicial killings related with the administration's war on drugs. De Lima also revealed during the press conference that as early as May 9, there have been sources approaching her camp telling them that there were already ongoing connivances between the senator's detractors and big time drug criminals from the national penitentiary to point her as a drug protector. De Lima's camp was even notified that it was only the start of a grander scale of character assassination set to destroy her burgeoning political career. It was only few weeks ago when Duterte affirmed De Lima’s decision to hold a senate probe regarding with the extrajudicial killings happening lately, saying that it’s the senator’s job to do so. Now, De Lima is clueless as to why the president has been exclusively targeting her suddenly although she pointed out the idea that this could have been due to their undesirable encounter years ago. 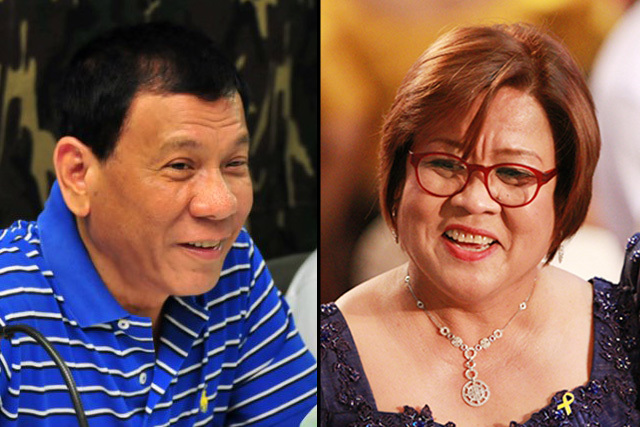 It can be remembered that the animosity between de Lima and Duterte traces its origins way back in 2009 when De Lima, who was then the Chairperson of the Commission on Human Rights, grilled the then Davao City Mayor Duterte on his suspected involvement with the Davao Death Squad, a notorious group linked behind the vigilante-style killings of suspected drug criminals around the city. De Lima failed to file a case against Duterte, admitting that she wasn't able to procure substantial evidence against the president. The word war between the two public officials was lit anew during the 115th anniversary celebration of the Philippine National Police held at Camp Crame in Quezon City on Wednesday (August 17) when Duterte hinted about a public official who is engaging in an "immoral" relationship with her driver who is also serving as her bagman in collecting money from illegal drugs. When the reporters continued to press for answers, Duterte himself blurted out "De Lima" as the main figure in his blind item. De Lima lashed out and defended herself against any involvement with illegal drug syndicates and drug payola but refused to reveal additional details of the exact nature of his relationship with Dayan. What the lady lawmaker only confirmed is that she’s still in touch with Dayan even after he resigned from his post in 2015. De Lima is rumored of having an intimate relationship with Dayan. 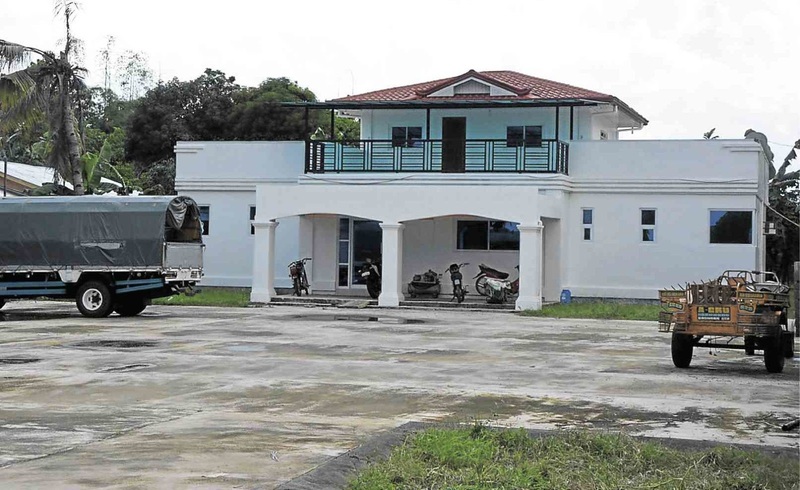 With regards to the controversial "white house" in Urbiztondo, Pangasinan, De Lima denied she built it for Dayan but admitted of having visited the place a number of times. The house stands on 2,482 square meter property and is under the name of a certain Elmita Torreta, who happens to be Dayan's sister. De Lima also slammed the existence of a scandalous video featuring her on it, her staff also seconded her statement. After the president's expose against the senator, Dayan immediately asked for De Lima's help as he fears for his safety. According to the senator, Dayan has been advised by local authorities to stay out of the picture as he might be implicated with the controversy and later on, be forced by greater powers to testify against his former boss. De Lima advised Dayan to remain vigilant and warned the authorities particularly the police not to drag Dayan in the issue without any substantial evidence. Aside from this, De Lima also expressed great concern for the safety of her family and told the public that no one is now safe at this point of time. De Lima even hinted that the narco-list which is under the possession of the president could have been tainted with innocent names included on it. Despite of this, De Lima remains firm to uncover the truth behind the extrajudicial killings. Allies of the senator like former Presidential Spokesperson Edwin Lacierda sympathized with de Lima. Other members of the Liberal Party have also been encouraging the senators to stand behind their embattled comrade but the Senate is quite cold with the idea. Senator Panfilo Lacson stated in an interview that the Senate cannot investigate the allegations of the president against De Lima noting that it only has jurisdictions over its members. Lacson however said that De Lima can of course practice her right to defend herself against the issues being thrown to her. On the other hand and in what seems to be a counter attack against the pending senate inquiry on extrajudicial killings, House Speaker Pantaleon "Bebot" Alvarez recently filed a house resolution that will investigate what happened with the drug-related cases inside the New Bilibid Prison while De Lima was still in DOJ. Meanwhile, Duterte called de Lima to stop acting as if she is the conscience of the society, saying that as a public servant, their lives are open book to everyone and it was the senator’s actions that placed her in hot water where she is today. It can be noted that the president has been catapulted to power due to his sincere and staunch fight against illegal drugs. Everything on it is non-negotiable for the president, and hitting prominent figures like the United Nations, the Chief Justice and now a senator is taking the Philippines back again into the global spotlight. With the recent remark of the president threatening the world to bolt out of the United Nations against its call to resolve the extrajudicial killings in the country, the president is yet to acknowledge the boundaries of his powers according to socio-political analysts. On the other hand, it is good that Chief Justice Sereno accepted Duterte’s apology otherwise this week could have been the week where the executive branch will be in a deadlock with the legislative and judicial counterparts. A constitutional crisis should be averted by all means, particularly at this point of time where the economy is set to achieve greater heights. The president’s men is of course in full support with him, but in this expanding case of major faux-passes that Duterte is committing against the international bodies and his fellow public servants locally, there should be a clear-cut strategy on how they should advise the president to cool down on issues that is affecting not only the reputation of the Office of the President but as well as the whole country. Human rights and women’s groups all over are also barking simultaneously over what they perceive as harsh and unprofessional remarks being made by Duterte. Like what Vice President Leni Robredo said on the issue, personal attacks don’t help. Regardless whether de Lima has committed immoral acts, there should be a clear delineation of that and the causes that they are fighting for. The battle against illegal drugs and extrajudicial killings are the centerpiece of Duterte and De Lima’s respective endeavors. While both are holding on to their principles, they should also maintain and uphold the value of respect not only for each other but for the nation who entrusted their faith on them.